One of my favorite things on blogs is discovering new *stuff*…whether it is art tools, kitchen gadgets, home products, etc. So, here are some of my “gotta-gets” for Spring. Cherry Pitter We eat a lot of cherries–this will seriously help our cherry eating capabilities. 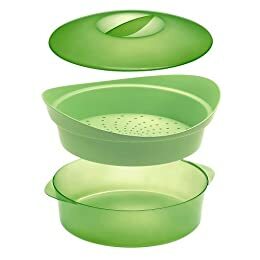 Steam + Serve Set The fast way to steam all those yummy spring veggies. Quick Chef Chopper An easy way to make salsas and toppings. Honestly, I never eat cherries because of the pit. It’s just too much of a whippin. But … with one of those … Oh Yeah! Yes, it is a pain and I did not know such gadgets even existed until recently…I gotta get me one of those!